Abaco, The Bahamas - Police in Abaco are seeking the public’s assistance in locating the person(s) responsible for the death of a male. Police are investigating the circumstances that led to a building fire in Abaco. Hope Town, Abaco, Bahamas – It’s one of the most anticipated annual events on Elbow Cay, where people from around the world come to enjoy warm weather, sea breezes and performances by some of Nashville’s best musical talents. 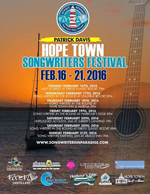 The Fourth Annual Patrick Davis Hope Town Songwriters Festival will be held February 16 - 21, 2016, at locations on Elbow Cay and Lubber’s Quarters Cay. 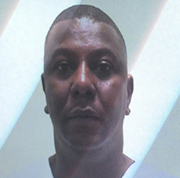 Abaco, Bahamas - Police in Abaco are searching for 41 year old Rosner Thervil of the Mudd, who is wanted for questioning for Possession of Dangerous Drugs with the Intent to supply. He is described as standing at 6’4” in height, brown complexion and average built with a low haircut. Please identify an individual whose leadership (particularly in the past year) has truly made an impact in your life and in the lives of others. Abaco, Bahamas - Police in Abaco are investigating a shooting incident that has left a 19 year old male in hospital. 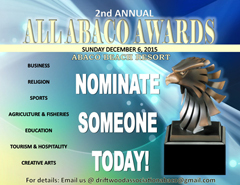 Reports are that on Sunday 16th August 2015 shortly before 5:00am, police received information that a male while in the area of a business establishment situated in Dundas Town, Abaco, was shot to his right hand by a male unknown to him with a firearm. He was taken to the Marsh Harbour Clinic by private vehicle and was seen by doctor. He is listed in stable condition. Police in Abaco are investigating the death of a male whose body was found floating in waters on Scotland Cay, Abaco. 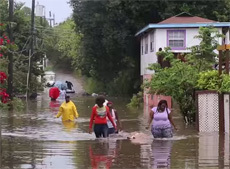 Reports are that on Wednesday 29th July 2015 shortly before 5:00pm, the body of an unknown caucasian male was found floating in waters on Scotland Cay, Abaco by a resident of the cay. 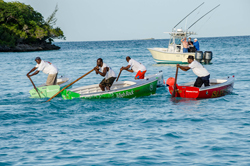 Treasure Cay, Abaco – Bahamian Brewery and Beverage Co. Ltd. helped Abaconians to enjoy the 42nd Bahamian Independence celebrations in a ‘Truly Bahamian’ way with their Sands ‘Man in The Boat’ sculling races. The event took place over the holiday weekend in Treasure Cay, right after the Abaco Regatta finals. 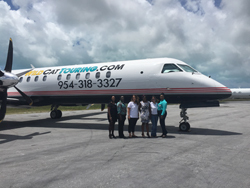 A new air service began in Abaco and North Eleuthera this month to supply the large demand for travel from those islands to the United States. Wildcat Touring, LLC began its service on May 1, 2015. Abaco, Bahamas - Police in Abaco are investigating a traffic fatality that has left a 49 year old male resident of the Pigeon Peas, Abaco dead. Reports are that on Friday 24th April, 2015 shortly after 9:00pm, police received information that a male travelling north on his bicycle on Don McKay Boulevard was struck by an unknown vehicle also travelling north but did not stop. EMS personnel were called to the scene and the victim was transported to the Marsh Harbour Clinic where he was later pronounced dead by doctor. MARSH HARBOUR, Abaco, The Bahamas – Dynamic public sector activity is centred on Abaco -- a rising tourism and investment centre. 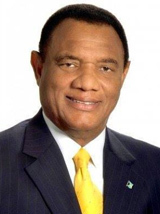 Ongoing investment continues in infrastructural improvement initiatives, such as road works in North and South Abaco, Prime Minister and Minister of Finance the Rt. Hon. Perry Christie said, on September 22, 2016 at Abaco Business Outlook. 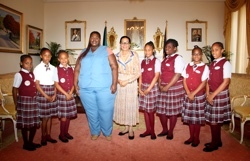 NASSAU, The Bahamas -- Students and teacher of James A. Pinder Primary School, Sandy Point, Abaco paid a courtesy call on Governor General Her Excellency Dame Marguerite Pindling at Government House on Thursday, March 24, 2016. Abaco, Bahamas - Police in Abaco are investigating a shooting incident and attempted armed robbery of an off duty police officer. In keeping with the Commissioner’s Policing Plan for 2016, on Monday 7th March 2016, police in Abaco conducted a road check in the area of Queen Elizabeth Drive, Marsh Harbour, Abaco, where a number of motorists were cited for various traffic infractions. Police in Abaco want to remind the motoring public that the police are committed in keeping our roads safe, and any persons found in breach of the road traffic laws will be dealt with to the fullest extent of the law. Police are reporting that the 38 year old male of Spring City, Abaco who was reportedly stabbed in the back on the 22nd December 2015 in Abaco by another male in the area of Don McKay Blvd has succumbed to his injuries at the Princess Margaret Hospital around 10:00pm on Friday 1st January 2016. A 20 year old male who is a relative of the victim is in police custody and is assisting police with their investigation into this matter.